Tennessee’s first scrimmage of the fall was closed off to the media on Sunday. But according to a report from Gridiron Now’s John Brice, there are a few details to be gleaned from Sunday’s scrimmage despite the lack of media presence. According to Brice, two true freshmen defenders made big defensive plays during the Vols’ 116-play scrimmage. Cornerback Bryce Thompson picked off a pass by Keller Chryst while Trevon Flowers intercepted a throw by Jarrett Guarantano. Another true freshman in the secondary, Alontae Taylor, earned a starting nod for the scrimmage according to Brice. He and Baylen Buchanan got the start at the two outside cornerback spots. Not only did some freshmen stand out, but a few other newcomers to Tennessee’s roster also made an impact in the first scrimmage. Per Brice’s sources, Keller Chryst had a solid performance in the scrimmage, tossing a couple touchdowns. One of his touchdowns went to Brandon Johnson while the other was a dazzling play by Jordan Murphy. The sophomore receiver reportedly also made an impressive grab on a throw from Guarantano as well. Chryst didn’t outpace Guarantano by much according to Brice. The fifth-year transfer might’ve had a better overall day, but the Vols’ redshirt sophomore signal caller still looked good and made some plays with his feet, something he rarely did in 2017. Tight end Dominick Wood-Anderson also looked more than capable in the passing game, pulling in a long gain through the air against UT’s defense. Also according to Brice, Tennessee’s main trio of running backs — Ty Chandler, Tim Jordan, and Madre London — all made some good strides, and Jordan in particular looked good in the red zone and scored a touchdown after bouncing outside and finding the edge. Pruitt said after Sunday’s scrimmage that he and his staff are still “a long way” from naming starters at any position on the roster. But assuming Brice’s sources are accurate, the Vols look like they could have some playmakers with their newcomers this season. Tennessee will hold two more scrimmages before the end of fall camp. Their next one is scheduled for next weekend. 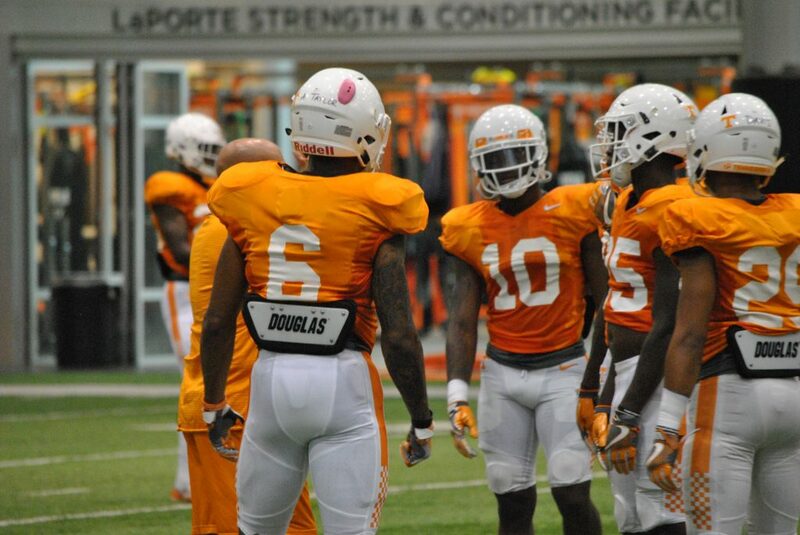 The Vols have an off day from practice today, but they’ll be back on the field on Tuesday. The Vols lacked big plays on defense last season and had trouble generating them on offense as well. Sunday’s scrimmage appeared to be a step in the right direction on both those fronts, but Pruitt also stressed the importance of finding “consistency and rhythm” on offense moving forward. You can read Brice’s full report here.